Raon Morris and Jungang Gongju won Seoul and Busan’s respective big 2-year-old races back in October and they are joined by 14 others as they step up a furlong to compete for the overall title of Champion 2-year-old. Seven fillies take their chance and two of them, Art Nouveau and Geumbit Hwanhui. 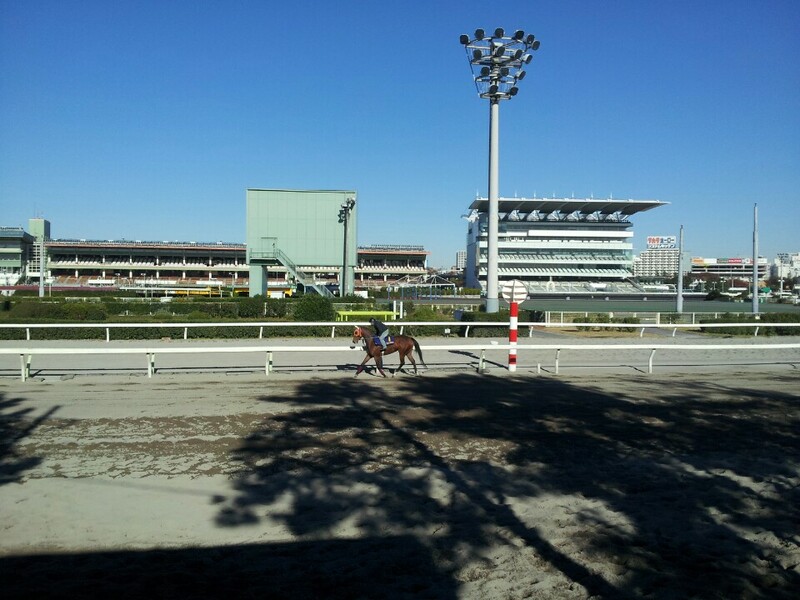 Meanwhile two foreign jockeys from Busan will be in town. Joe Fujii partners Queen’s Blade – which means it is to be watched very carefully – while Jerome Lermyte makes his capital debut on Namdo Trio. The results of the public vote for invitations to the Grand Prix Stakes at Seoul Race Park on December 15 were published today. Like Japan’s “Arima Kinen” the public gets to choose which horses they want to see run in the season-ending showpiece. This year 42 horses – 21 each from Seoul and Busan – were on the ballot with the top 8 from each track getting the first invites to fill the maximum field size of 16. Connections are still under no obligation to run but it is expected that most will. 2012 Korean Derby winner Jigeum I Sungan topped the Seoul vote with Smarty Moonhak, 3rd in the race as a 2-year-old in 2011, just behind him. That year’s Grand Prix winner Tough Win was the public’s 3rd choice. At Busan, Gukje Sinmun winner Beolmaui Kkum headed the poll with recent President’s Cup winner Indie Band in 2nd place ahead of Gyeongbudaero. 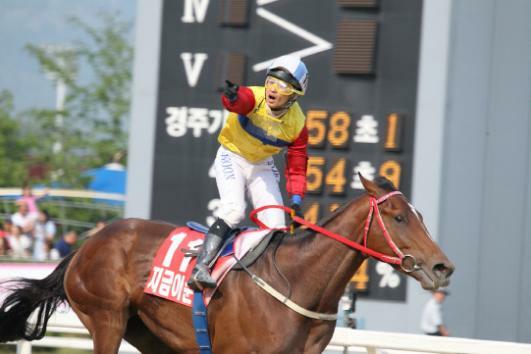 2012 Grand Prix winner Gamdonguibada was 4th in the Busan vote. Peter Wolsley’s Governor’s cup heroine Secret Whisper is sure of a run, having come in 5th but the Aussie trainer’s other hope, Cheongchun Bulpae is missing out at the moment. In what was arguably the finest ever race run by a Korean-trained racehorse, Watts Village won the Japan-Korea Interaction Cup at Ohi Racecourse in Tokyo tonight. After coming so close to winning the first leg of the Korea vs Japan challenge in Seoul back in September, Watts Village made no mistake this time as, under Seo Seung Un, he led from gate-to-wire to record a famous victory in the Japanese capital. It was a perfectly timed ride from Seo. Watts Village took an early lead and maintained it as his challengers massed behind. In the final furlong they pressed and pressed. The pressure was relentless and they came so close to sweeping by but gamely, gallantly, Watts Village held on. Miyasan Cutie and Kogyo Douglas came closest to him, finishing an oh-so-close 2nd and 3rd. In a race that was always to be dictated by early speed, the other Korean challengers Fly Top Queen and Full Moon Party gave what they could but were found wanting. Watts Village nailed it. A three-year-old colt, Watts Village (Forestry) had, by virtue of his runner-up position to Tosen Archer in Seoul in September, already achieved an official rating of 100. This qualified him to run in Dubai this winter. Connections had not been sure whether to take the offer up but now, with him already having passed Japanese quarantine, he might just go for it. Nobody thought it could happen but tonight Korean trained racehorses went to Japan and against all odds – literally – one of them won. Korean horse-racing took a huge step forward tonight. Japan bested Korea in Seoul back in September. Revenge is the name of the game when three Korea-trained horses line up at Ohi on Tuesday night in the “Japan Korea Interaction Cup”. While Tosen Archer, winner of that race in Seoul, tries to repeat his victory, Korea is this time represented by unbeaten filly Fly Top Queen, the nation’s most expensive import. Watts Village, who was turned over in the final strides at Seoul, also takes his chance again while the visiting challenge is completed by top sprinter Full Moon Party. They will face a home team that is dominated by speed. Indeed it seems that whoever gets to the first corner in front, will have an excellent chance of holding on. The Korea contingent need to make sure that it is them. Good figures but has only run 4 times this year and not since August. Is likely to be close to favourite but will need to run to her best to win. The only Korean-bred entry among the Korea raiders, she’s also the least fancied although she beat a host of big names in the TJK Trophy in August. Needs to get to the first corner first; if she does, anything can happen – if she doesn’t she’ll be well-beaten. 3 wins from 5 starts this year and looks like he will like the drop back to 6 furlongs. In form and a real chance. She’s Korea’s most expensive ever import and she’s never been beaten but so far she’s yet to face very much at all. Has travelled well and is said to be relishing the chance to run clockwise at Ohi. Most observers (including this one) are convinced she would have won the 1st leg in Seoul had she run. If she leads into the home straight, she wins. While almost all of his wins have come oveer this distance, he’s been in dreadful form this year. No reason to think that will change here. Second to Tosen Archer in Seoul, he has every chance of beating him here – the only trouble is that Tosen Archer probably won’t be winning either. Like so many in this race, if he gets a good run early, he has a chance. If he doesn’t, he will fade. His dam’s name might not appear in the Studbook but he certainly has some speed. Again, he needs to be at the front early to show. 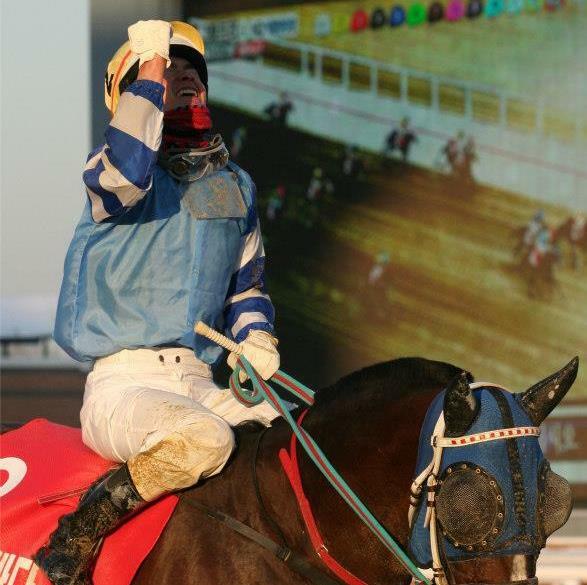 His jockey rode successfully at Busan for a year. He’s not got much chance of being successful here as Adolescence falls very much into the category of “old stager”. He’ll not be embarrassed but he’ll not be competing for the win either. He ran in the 1st leg at Seoul and finished 6th. It would be a surprise if he finished any higher here. A horse who is always there or thereabouts and could be again. Without a win in almost 2 years but he always goes close. Tough to recommend him to win but he’ll not be going home without some money. 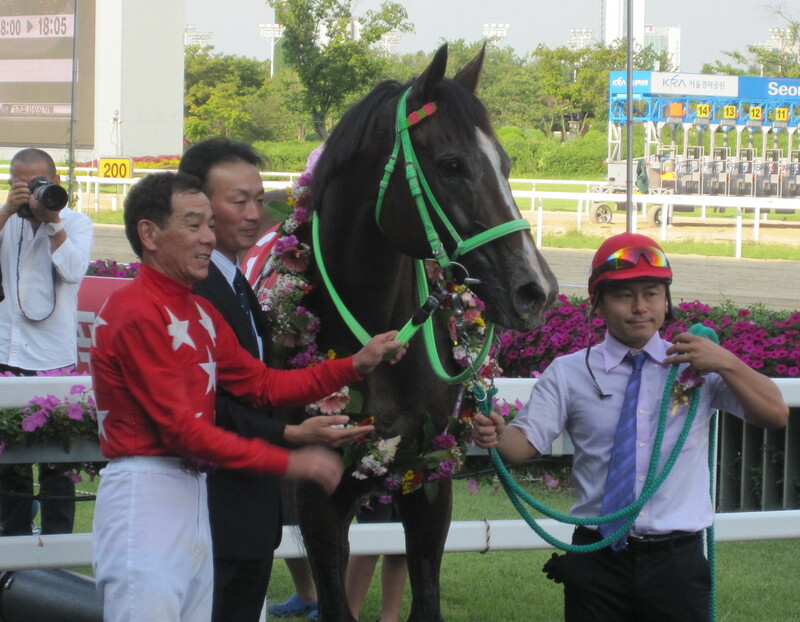 He won the 1st leg in Seoul due to an inspired ride by 57-year-old jockey Fumio Matoba. It won’t happen here. 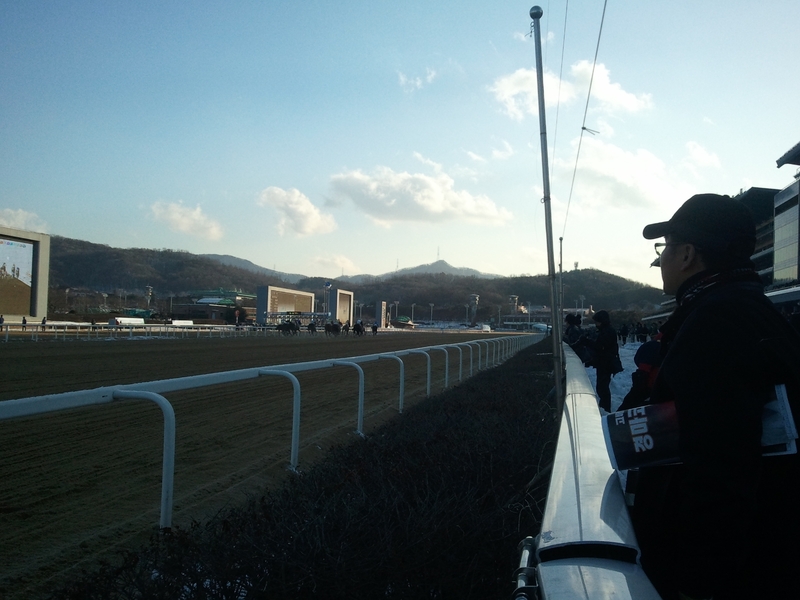 Ohi’s track doesn’t lend itself to closers in the way that Seoul’s does and the rest of the field will be wise to him. Must be given respect though. A physically very impressive specimen, Auxerrois is without a win or a place since January 2012 and his recent form suggest he will not be in contention. Won three races in a row at Ohi this summer and must be in with a chance. Was only 6th last time out but with a drop to 6 furlomgs, he could bounce back. Difficult to recommend a horse that hasn’t won since 2010 so we’ll not be doing that here. Yasaka Fine has put in some creditable performances recently but will not be coming close in this one. Thanks to uk_maniax for translations. Joe Fujii became just the third ever foreign rider to reach 100 winners in Korea as he completed a double at Busan Racecourse this afternoon. The Japanese jockey’s milestone came in race 11 as he partnered 4/1 chance Heba (Peace Rules) to victory. That win – his second of the day – enabled Fujii to join his fellow countrymen Ikuyasu Kurakane and Toshio Uchida as century-getters in Korea. His 100 includes some of Korea’s biggest races. He won the Grand Prix Stakes on Gamdonguibada last year and followed up with a Korean Derby and Korean Oaks double on Speedy First in 2013. Joe – “Kanichiro” – Fujii has never ridden in his homeland of Japan, having travelled to Australia as a teenager to train as a jockey. He narrowly missed out in the JRA exam this year and Japan’s loss is Korea’s gain as he continues to be the most in-demand jockey at Busan. A highly professional rider, Fujii is also a highly likeable character who is a real student of horse racing. One of very few foreign riders to have studied racing in Korea in detail before making the move here, he’s managed to not only become number 1 to Korea’s top trainer Kim Young Kwan, but also to achieve the almost impossible – to be liked by the local jockeys (although of course they would still love to see him depart). His diligence has been reaping rewards with winners ever since he arrived and there’s no sign of it stopping. 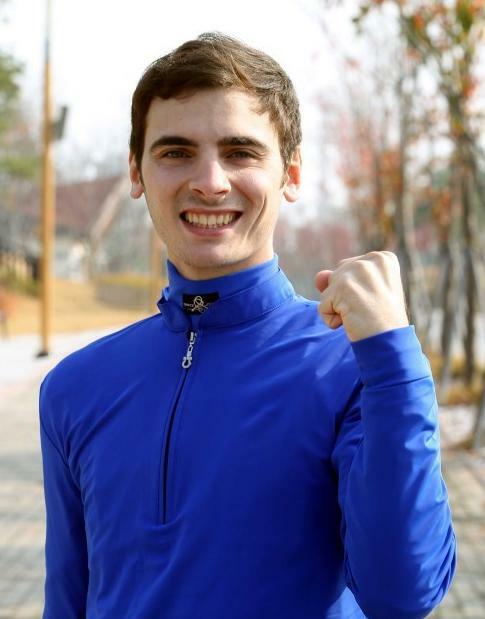 There’s another addition to the foreign jockey ranks at Busan as French rider Jerome Lermyte makes his Korean debut on Friday. The 24-year-old Lermyte may be young but he’s certainly well-travelled. He started as an apprentice in France in 2005 and in his homeland he’s won several decent races including three “Tierce Cups”, the Derby de Lyon, the Grand Prix De Lyon and the Derby D’Angers. Lermyte’s career also took him to Germany, Mauritius, the USA, Qatar and Kuwait before spending 2 years in Macau. Earlier this year, he had a stint riding in Western Australia. With Ureshi Katsunori departing, Lermyte joins the Japanese pair of Joe Fujii and Masa Tanaka and Britain’s Darryll Holland as Busan’s overseas riders. Japan’s Ikuyasu Kurakane and Brazil’s Fausto Durso are the only foreign riders at Seoul. Lermyte, who has a racing weight of 51kg, will have his first ride on Lethal Yeowang in Race 6 on Friday. 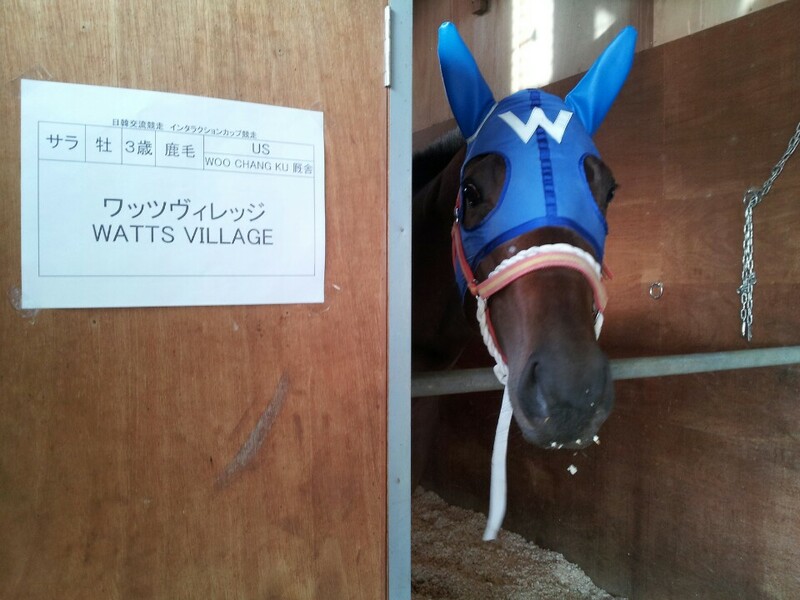 After spending a week at a quarantine facility 200km north of the Japanese capital, Fly Top Queen, Watts Village and Full Moon Party have finally arrived at Ohi Racecourse in Tokyo. The trio have made the trip across the East Sea to take part in the 2nd leg of the Korea vs Japan Challenge at Ohi next Tuesday evening. We’ll have a full preview of the race next Monday. In the meantime, check out our Facebook page for more pictures.